It is a wonderful gift to chase a dream. Mine is to compete at the highest level of my sport - Nordic skiing. Competing in an Olympic sport for a National team instead of a sponsored trade team has its benefits and setbacks. The benefits are that when I race on the World Cup circuit, I get to represent not only my teammates and myself, but also my country. Just ten years ago, the U.S. Nordic ski team was a serious underdog. The athletes and coaches worked together to create the most positive and inspiring team atmosphere possible to push the limits of what was possible. I watched in awe on TV as my sporting heroes started to get top tens, podiums, and wins at World Cups and World Championships. All of this work and belief culminated in an Olympic Gold medal for Kikkan Randall and Jessie Diggins in the team sprint event in Pyeongchang just earlier this year! These heroes, in the last few years, have become my teammates and friends. They have paved a path for all of us up-and-comers to keep pushing the limits of what is possible. I can’t wait to see what we can do over the next few years leading into the 2022 Beijing Olympics! How did this Olympic dream start for me? In elementary school, I used to wear my mom’s 1984 Olympic gold medal around the house as a necklace - throwing my arms in the air like I had been the one to win it. I didn’t really know the significance of it at the time but I’m sure it stoked a small flame inside of me that has only really started to burn bright in the last few years as I’ve focused more and more on my own athletic goals. My parents are both 1984 Olympic medalists in road cycling. My older brother is now a three-time Olympian in cycling as well. You could say it runs in the family. There is some pressure to this athletic legacy, but mostly it simply inspired me to know that my family members had found something they loved, worked incredibly hard at it, and were able to be among the best in the World. My family has passed down the notion to me that it is a great privilege to chase a dream, and it never comes without struggle, but it is often in the struggle that you find the joy. I never found that fire with cycling, but I have found it in Nordic skiing. I developed a love of Nordic skiing as a kid thanks to chocolate bribes by my parents. Which makes this partnership with Ritual such a wonderful and genuine match. Because what is better than being outside in winter and enjoying some chocolate along the way? Besides bribes of sweets, my dad would often weave together tails about the dwarves, gnomes, and elves that dwelled in the forests that lined the trails we were skiing. To this day, I still feel that twinge of wonder when I ski. Nordic skiing is not the easiest sport choice. It requires year-round aerobic and strength training as well as hundreds of hours of technique work to ski gracefully and quickly. Once you have that base, however; it opens up a world of magic. I am constantly blown away by how lucky I am to explore places with my skis on. I love the challenge, humility and triumph that competitive sport provides, but beyond that, I am grateful for the connection to the places I have skied and the people I have skied with that Nordic skiing specifically provides. I race to experience the fire of competition. I Nordic ski to experience magic in my everyday life. The combination of the two is when I feel most alive. When the gun goes off, I feel completely in the moment and in synch with my body and mind. It is a feeling that I hope every person can experience while doing something they love. It can feel uncomfortable to ask for so much support to pursue an athletic dream. I often question if I am being selfish. But then I think about the work my team does with the kids in our community, and the work I get to do through organizations like Little Bellas and Fast and Female because of my platform as a professional athlete. Sport makes us feel strong, empowered, humble, proud, disappointed, and joyful. It can create lifelong relationships. It can provide us with greater self-worth, greater respect for others, and a greater appreciation for the world. It teaches us about work ethic, goals, camaraderie, failure and success. I think it helps people be better humans. It certainly has had that effect on me. This is the Olympic dream to me. It’s about victory and loss, sure. But it is also about putting everything you have into something and then being vulnerable enough put your dreams on display. Making the Olympics may seem like a superhuman endeavor, but I think more than that, the journey to get there shows us much of what it means to be human. I feel incredibly lucky that Anna and Robbie are helping me this year by making my favorite chocolate bar into a funding opportunity so that I can afford to chase this Olympic dream. Whether you choose to buy this bar because you love mint chocolate or because you want to support my ski season, please know that you are fueling a dream that couldn’t be reached without your support! CLICK HERE TO BUY THE BAR TO SUPPORT KELSEY’S OLYMPIC SKI DREAM. There are flavors that always remind me of spending time with my family during the winter season. Some of these flavors are: hot chocolate with marshmallows, pumpkin pie, chili, chocolate chip cookies, and eggnog. Of course there are more festive flavors out there, but these are a few that come to mind. 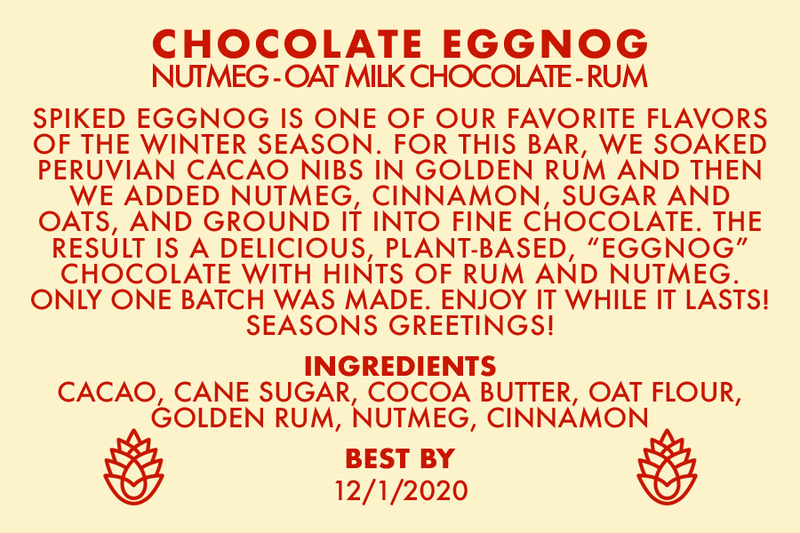 Somehow, through our early planning process for our December Limited Edition bar release, we landed on the concept of Eggnog. It’s not like any of us are particularly obsessed with eggnog, I mean, who could be, it’s so rich that more than one glass would probably cause immediate cardiac arrest—but that one glass sure is good, especially with a splash of rum. For almost a full year now, Anna and I have been eating almost an entirely plant-based diet. So for the eggnog bar, we wanted to find a way to make it creamy, like eggnog, but without the egg yolks and heavy cream. Of course, we’re talking about a chocolate bar here, not a drink, so at the end of the day there’s no way to truly replicate a drink in a solid bar of chocolate, but we can try! We started the R & D phase by first trying to come up with a unique and possibly innovative plant-based milk chocolate. We tried adding coconut flour, coconut oil and even tapioca, just to see what worked and what didn’t. Finally we tried making a test batch of “milk” chocolate using oat flour. The flavor was good and the consistency was good, and the “creaminess” factor was just about where we wanted it. So the main base of the Eggnog bar is our Peruvian cacao with organic cane sugar and oat flour. Next, we had to nail down the right combination and ratio of spices. Traditional eggnog usually just calls for nutmeg. Sometimes other things like cinnamon and clove are added too. We decided we’d stick to nutmeg as the main spice and cinnamon as the secondary spice. For the first test batch, I don’t think I added enough nutmeg. For the second test batch, I think I added too much. And we finally nailed the ratios on the third test batch. When things were running smoothly on the roll mill. For the official full batch, which we were targeting to be around 250 lbs, we still had the issue of adding rum flavor. After doing some research we did find that it was possible to buy rum flavor, rather than pure rum. However, as we are purists, we decided to stick to the real thing. Imparting liquid flavors into chocolate is no easy task. As all of us chocolatiers know, liquids and chocolate are opposites and they don’t get along. Fortunately, this is something we have experimented heavily with in the past, so we had a good idea for what to do. For the full batch, we ended up soaking all of the nibs in 12 liters of golden rum overnight. And then in order to concentrate the flavors and remove moisture, we dehydrated the nibs, along with all of the rum, in the oven until the nibs were mostly dry. The rest of the process was a simple matter of doing what we regularly do best: grinding, mixing, refining, conching, tempering, molding and wrapping. Not everything was as straightforward as usual though. The chocolate viscosity was very high, probably due to the oats and the moisture from the rum. This didn’t exactly create any major problems, but I had to work a bit more slowly. Due to the size of one of the pre-grinds, and the unusual viscosity, I did have one minor/major accident (depending on if you’re a glass half full, or half empty kind of person). For some reason the blob of chocolate on top of the roll mill got into a wavy rhythm and eventually lurched forward onto the exit roller, which meant it all got flung directly at our viewing window and all over the wall and floor. I think we lost about 5-10lbs in this spill and I had to send the chocolate through the roll mill 3 times because some unrefined chocolate landed in my refined chocolate bucket. Other than the roll mill flinging chocolate at our viewing window, which was embarrassing, the chocolate was pretty fun to make. The smell of rum, nutmeg and cinnamon filled the air and smelled a lot like the holidays. Of course, it was also fun and delicious to try the chocolate regularly during every stage of the process. It’s not often that we stray from pure chocolate and work with other flavors, so it felt pretty refreshing. At this point, this is our second “official” Limited Edition bar. I put official in quotes because we’ve actually done three, but only two were fully made available to all of our customers. The first Limited Edition bar was our collaboration bar with Cacao Review, and that bar was amazing, but even more limited than our regular Limited line. 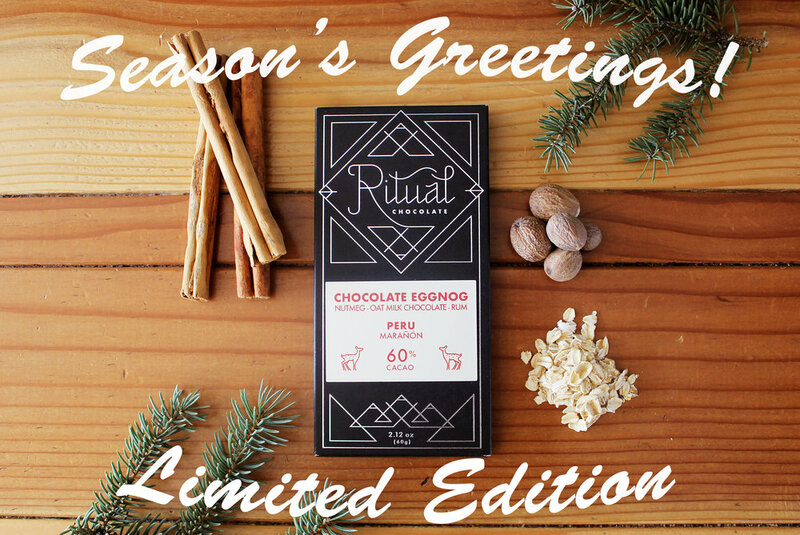 From everyone here at Ritual Chocolate, we hope you enjoy our Chocolate Eggnog bar and have a wonderful winter season! Pictured with almond milk and blueberries on top. But I often switch up the fresh fruit I add. Is it possible to have an addiction to granola? I have to admit that I generally eat one bowl a day minimum. 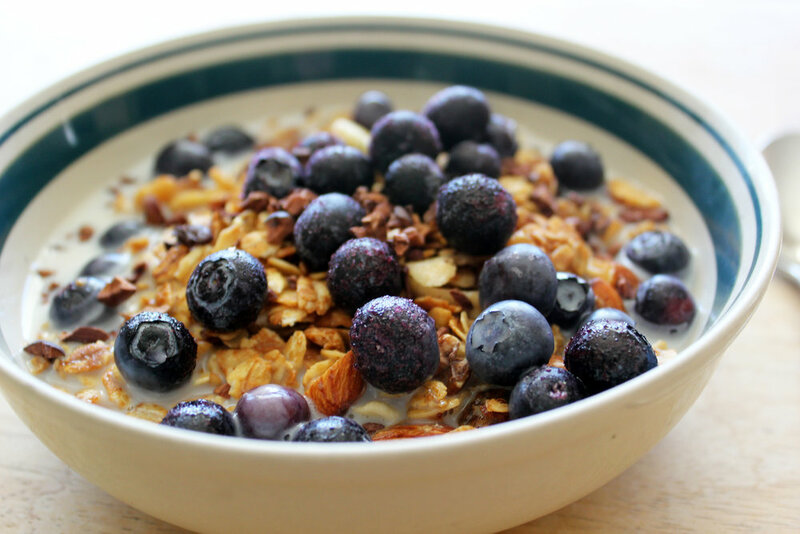 I think the beauty of granola is it’s a healthy, comfort food (as long as it isn’t too sugary of course) and it’s a good go-to option for a lot of different situations. 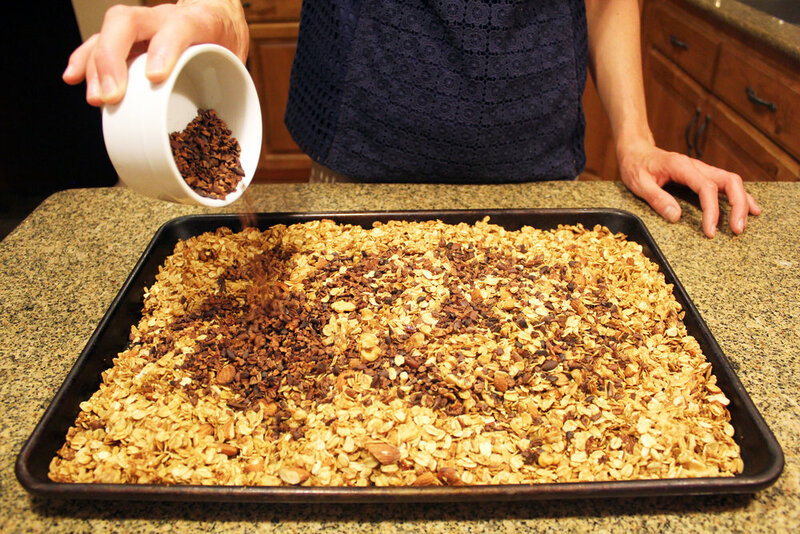 If you are having a bad day, you can make a batch of granola at night and start the next day with a good breakfast. I often give granola as a gift for the holidays or for someone hosting us. It’s the perfect pre bike ride/ recovery food and a great start to a busy day at work. I’m never left crashing an hour later like other breakfast options. Need I say more. To me granola is the new avocado toast. Our current recipe has a mix of chopped walnuts and almonds, but I'll often add pumpkin seeds, sunflower seeds and spoonful of millet for an extra crunch. I’ve been making granola for over 10 years now and I have to say, I enjoy making it almost as much as I enjoy eating it. I would make big batches in my dad’s kitchen using his cast iron Aga cooker. I loved that I could make the recipe a little differently every time depending on the nuts, seeds and dried fruit that I wanted to add. I would often add barley malt extract as a sweetener which gives it a rich, malty flavor and makes for a great vegan option. Giving the granola a mix halfway through baking so it toasts through evenly. Eva our Newfie (Newfoundland) loves granola too. 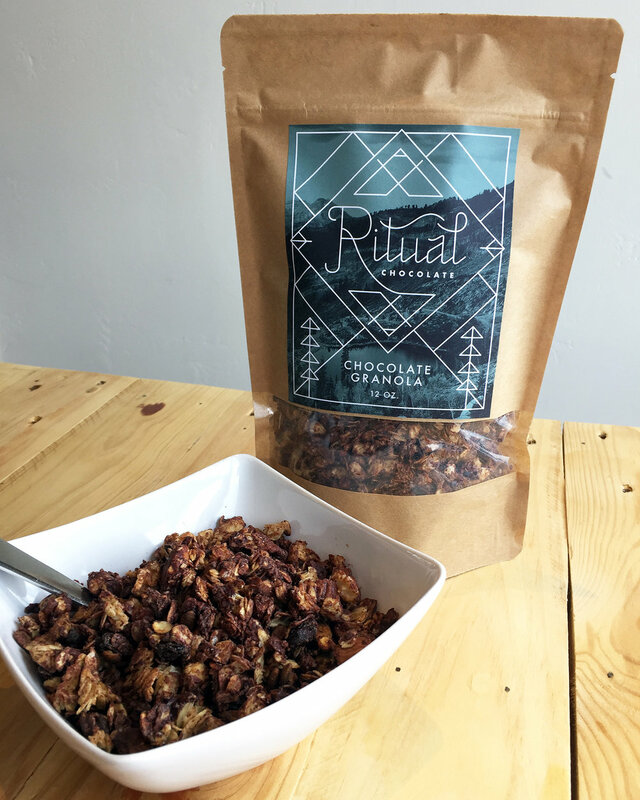 So when we were opening our Ritual Chocolate cafe in Park City, I wanted to have my granola recipe on the menu in some form. This time we thought it would be great with a chocolate twist, so our Chocolate Granola recipe has a tasty addition of roasted cacao nibs to give it a bit more crunch and light coating of melted chocolate for a chocolate-y kick. It’s just like the granola I used to make back on my father’s farm in England, now with some high quality cacao! I add the roasted cacao nibs with the dried fruit after the rest of the ingredients have been toasted, as the nibs have already been roasted to a good point for flavor. As always, you can swing by one of our cafes to pick up a bag or find it online here. We are pleased to announce that we were the recipient of 9 medals at the 2018 Academy of Chocolate awards, making Ritual Chocolate one of the most highly awarded brands at the Academy this year. It is an honor to be recognized at the international level for our commitment to super high quality chocolate. We have always strongly believed in our somewhat unusual, yet old fashioned, chocolate making process, so it is exciting to be rewarded for our efforts. And of course, we couldn’t make award winning chocolate without great quality cacao, so we’d like to thank all of our suppliers for producing excellent cacao. If you haven’t tried all of our award winning chocolate, you’re in luck, all of our Academy of Chocolate awarded bars will be 20% off until June 17th! A record-breaking 1,200 entries have been judged at the 2018 Academy of Chocolate Awards - 400 more than last year, rising from 12 when it first launched in 2005. The entries, made up of chocolate produced in more than 45 countries, included a significant increase in chocolate made by smaller producers—reflecting growing awareness of the origin, craft and sustainability of real chocolate. Held at Westminster Kingsway College, London, industry experts took part in 15 days of judging - deliberating over key categories including Bean to Bar, Tree to Bar, Flavoured, Milk and White Bars, Filled chocolates, Spreads and Packaging. The winners of the famous Golden Bean and other special Academy of Chocolate 2018 Awards will be announced at a glittering ceremony at Claridge’s in July. For anyone who has followed our chocolate journey, you’ve probably noticed that we’re also obsessed with riding bikes. While there has never been any strategic intention to share our love of cycling, it occasionally sneaks through the cracks because it’s just who we are. We love cacao, we love chocolate, we love machines, we love nature, and we love to ride our bikes. Introduction to the Ritual Chocolate online Journal.